Epoxy and urethane are most often the two choices for food industry flooring in Ontario. Both surpass all the rigorous safety compliance demands of health officials to ensure safety and cleanliness. Not only are epoxy and urethane floors safe and hygienic for the food and beverage industry, they are also easy to clean, and long lasting. 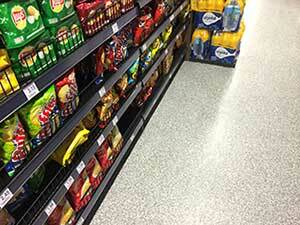 Concrete floor coating systems are a popular choice within the food industry. At Diamond Rock we believe in customizing concrete floor coatings for the food industry to satisfy the customers needs. Epoxy may the best solution for customers requiring hard, durable floors. However, urethane would be a better choice if lactic acids found in milk, dairy and cheese production are involved. For the most part it’s usually best to build up the floor with epoxy and use urethane as a sealer. Epoxy bonds extreme well with concrete where urethane does not. Together, the floor will last much longer against scratching, corroding, yellowing, and heat/cold extremes. Our non-porous floor coating options are designed to endure food spills and aggressive wash-downs with harsh chemicals to kill bacterial contamination. For added health and safety, we can ensure your floors are slip resistant. Concrete flooring coatings are frequently used in cafeterias, restaurants, grocery stores, dry and cold storage rooms, canning and slaughtering areas. The epoxy and urethane finishes we apply are attractive, durable, and extremely cost effective lasting far longer than other types of flooring. We will take your drab and damaged concrete floor and turn it into a beautiful work of art you and your guests will be proud of. Not only will your new concrete floor finish look amazing, it will be easy to clean due to its resistance to spills, including grease. It is also moisture resistant. From the initial quote to job completion everything will be handled professionally. 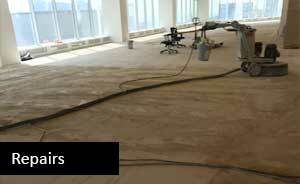 We use a dust free industrial grinder to prepare your concrete floor. 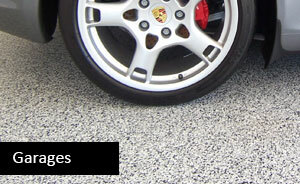 The grinding head consists of diamond blades that lightly cut your floor’s surface preparing it for maximum adhesion. During the process, old stains and coatings are removed before any materials and epoxy or urethane are applied. The products used on your floor are all non-toxic. 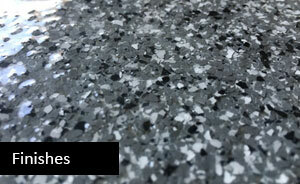 As a result, your new flooring will be durable, waterproof, and chemically resistant. With little maintenance, it can also last you a lifetime. For a FREE, no obligation quote on having an epoxy coating applied to your concrete floor, call us, or send us a quick email. Includes London, Stratford, Kitchener, Guelph, Cambridge, Hamilton, Brantford, Sarnia, Chatham, Windsor, and all the small municipalities in between.